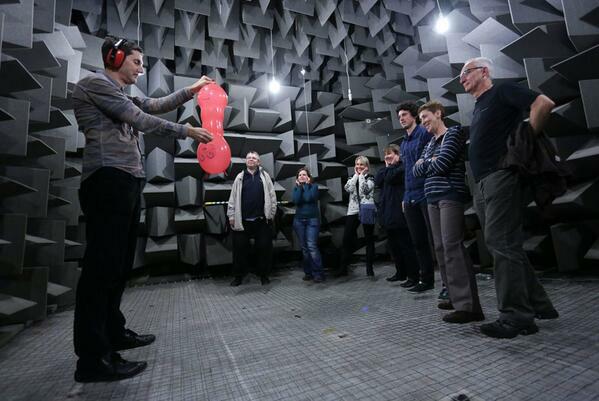 When people talk about the anechoic chamber at University of Salford the focus is usually on how quiet the place is, and how the only things you can hear are sounds made from within your own body. But to many visitors the most immediate effect is how voices take on a claustrophobic character. Often visitors will say it sounds like they’re in an aircraft and their ears need to pop, or that everything sounds very muffled. You don’t get this effect if you hear silence outside, say in a desert. I hope this recording might give you a sense of what it is like. It isn’t a voice recorded in the anechoic chamber, because that doesn’t sound vert different from someone talking in a radio studio. So I tried recording something different. This is the sound of a balloon bursting in the anechoic chamber (a round one, not the strange shaped one in the picture). You might need to play it a couple of times to hear it. Yes, that short clicking sound is a balloon bursting. What about something even louder? This is the starting pistol we normally use for measuring large concert halls. I’ve never been so impressed by two such underwhelming sound effects!Because there are no reflections from the walls, floor and ceiling of the anechoic chamber, all you hear is the short sharp initial sound with none of the embellishment a gun shot or balloon burst gets from room. It’s like hearing just the B from the Bang. But why do people in an anechoic chamber listeners think their ears needs to pop? My best guess is that this happens because through their eyes visitors are seeing a room, but through their ears they aren’t hearing any reflections. Someone talking in the anechoic chamber sounds quieter than we expect because of the lack of any room reinforcement. Like the balloon and gun shot voices sound muffled. One common situation where we get a mild loss of hearing is up on a plane where the pressure in the middle ear exceeds the pressure outside. This can cause the ear drum to vibrate less and our hearing abilities to be reduced. Do you have any other suggestions for things I can measure to show off the acoustic of the anechoic chamber? Please comment below. This entry was posted in anechoic and tagged anechoic chamber, balloon, bang, burst, gun shot, muffled, planes, university of salford. Bookmark the permalink. Interesting article. Apart from the obvious uses of an anechoic chamber for measuring the free field frequency content of a sound source or noise floor of a sound level meter I wonder how animals that use echo location would deal with such a non reverberant environment. Would they still be able to navigate through an anechoic chamber? For obvious reasons you cannot test it on the real thing but would be interesting to see if the sound signal of a bat is reflected in any way. Is it easy to reproduce the sound signal of a bat through loudspeakers in an anechoic chamber? The bats would probably just fly into the wall and fall onto the ground. A colleague took a blind person around the anechoic once and they thought it was great, if a little disconcerting to lose all the audio cues that a blind person uses to help navigate. Hello, interesting article, good job! I’m looking for the sound of the balloon popping, is there any way that you can send it to me, please? My mail is nschmidtg@gmail.com, It will help me a lot in an arcticle about the echo at geodomes. I’ve found this idea to be very true when mixing live sound. If the type of artificial reverb being applied in the mix doesn’t match what you’d expect from the visuals of the room it can seem very fake, and this becomes more apparent the more light there is. You don’t realise that you expect something to sound a certain way, until it doesn’t. I am currently working in a Project about auralization, in University of Minho (Portugal), and we are looking for an anechoic sound of a car, recorded in free field, to use in an experiment about looming sounds. As we haven’t found it yet, I am writing hoping that maybe you will have or know more about where we can look for it. I am currently working on a project of gunshot detection and currently looking for a database of gunshots recording in anechoic chamber. Kindly send me the link if such a database is available online. Pingback: Just the B of the Bang | Words from Cheshire Engineering Corp. I doubt it. We did measure this for the BBC once, and it was surprisingly loud but much higher frequency than a church bell. I am very sound-sensitive and easily-startled by sudden explosive or impact-type sounds that aren’t necessarily loud – eg, anything being shut; objects being put down on surface; anything being tapped/clapped together; balloons being burst; gunshots and fireworks; thuds and clangs, to name a few. I am therefore painfully conscious of how ‘loud’ everything sounds in most modern interiors, and often wish these could be built more like ‘anechoic’ chambers! Is it that (cheaper?) modern interior building materials are just more rigid and brittle, and therefore any sound is reflected more sharply? And/or that building methods are mostly done on the cheap and/or as fast as possible, so that ‘niceties’ like good sound-insulation/absorbency are dispensed with?